Poets say you can't put a price tag on love, but you can run up plenty of expenses while searching for it. The popular Tinder hook-up app unveiled a for-pay premium option this week, with a tiered pricing plan based on age: Tinder is free but Tinder Plus will cost you $9.99 per month unless you are 30 or older, in which case it'll cost you $19.99 per month – a penny more than double the price. Tinder says its age-based dichotomy is because younger users tend to have tighter budgets and probably can't afford to pay $20 per month, unlike the presumably wealthier and more established 30-plus folks. Of course, adults of all ages will still be able to sign up for free, though limited, use of Tinder. 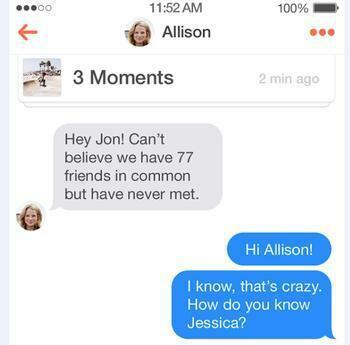 Here's a brief overview of how Tinder works. It's similar to a “standard” dating service, helping you find theoretically compatible possible matches based on your stated interests and whatnot, with the added advantage of geographical compatibility: as a Tinder user, you program in a certain geographic radius, and the app will let you know about possible matches in your immediate area. When you see a picture of a possible match, you swipe the picture to the left if you're not interested, and to the right if you are. This swiping is done anonymously; you don't know who used a left-swipe to show disinterest in you, and those you rejected by swiping to the left won't know about you, either. If you right-swipe someone who also right-swipes you, Tinder considers that a “match” and “introduces” the two of you for a chat. For frequent Tinder users, swiping becomes so commonplace and downright automatic that a lot of people will make mistakes – specifically, they'll automatically left-swipe a picture they'd actually wanted to swipe right. With the ordinary, free Tinder app, there is no way to undo such an error: once you left-swiped a picture into the disinterested pile, you couldn't get it back. However, Tinder Plus subscribers will have the option of undoing a left swipe. Now that Tinder is offering a paid Tinder Plus option, ordinary non-paying Tinder users will start seeing limits on how many pictures they can right-swipe in a given month, too, whereas for Tinder Plus subscribers the swiping opportunities will be limitless. Back then, the only thing you could do with a cell phone was talk on it, and maybe customize your ring tones. There were no such thing as “apps” for people on the prowl; we had to work for our hook-ups, dagnabbit. My future husband and I met each other in a seedy, disreputable and poorly illuminated bar, the way Zod intended for irresponsible young couples to meet. On the other hand, even $19.99 per month is probably cheaper than frequent bar cover charges.